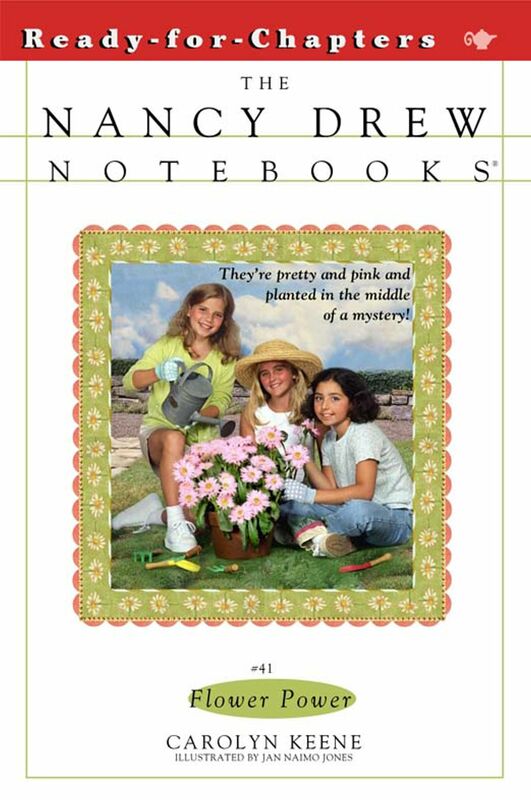 Nancy and her friends agree that the Pink Princess daisies they've grown from seed are the prettiest flowers ever. They're sure to win a prize at the spring flower show. But shortly before the event, the daisies disappear! Snobby fourth-grader Viola Van Hall told the girls that her flowers were going to take first prize. Classmate Orson Wong wanted the daisies for a horrible science experiment. Belle Bridges sprinkles flower petals all over her salads -- she might have eaten the daisies. Have the girls lost the chance to win the contest, or is the answer to the mystery right under their noses? "Aren't these the most beautiful flowers you've ever seen?" Eight-year-old Bess Marvin was sitting in the backseat of the Fayne family's car. She held up a flowerpot containing a bunch of frilly pink daisies. Nancy Drew, who was sitting next to her, nodded. "Definitely! I think we're going to win first prize." "I know we're going to win first prize," George Fayne piped up from the front seat. George's real name was Georgia. She and Bess were cousins, and Nancy's two best friends. Mrs. Fayne, who was driving the car, smiled at her daughter. "Now, don't you girls get your hopes up too high. You're facing a lot of competition, you know." "No problem," George said. "Our Pink Princess daisies rule!" Nancy giggled. George and Bess were right. Their Pink Princess daisies really were the best. Mrs. Fayne was the vice president of the River Heights Garden Club. The club was sponsoring a flower show at the Civic Center. The show was opening in just three days. Lots of prizes were going to be given at the flower show. There were two special children's prizes for flowers grown from seed: most beautiful flower and most original flower. Three months earlier -- way back in winter -- Mrs. Fayne had tried to convince George to grow a flower for the show. At first George hadn't been too excited about the idea. She was more into sports than flowers and gardening. Then one day Nancy, Bess, and their friend Julia Santos had been at George's house. The four of them happened to leaf through one of Mrs. Fayne's seed catalogs. They saw an ad for a rare type of daisy called the Pink Princess daisy. It was being sold with a limited-time offer. That meant that they could buy the seeds only for a short amount of time. Right then and there, they decided to pool their money, order the seeds, and enter the contest together. Now it was April, and the daisies were in full bloom. Nancy, George, Bess, and Julia had been passing the pot around for the last three months to water and fertilize it. Bess had had it for the past week, during most of the girls' spring vacation from school. Now it was Julia's turn. "Here we are at the Civic Center!" Mrs. Fayne announced, turning the car into the parking lot. Mrs. Fayne was going to help the other garden club members set up for the flower show. George and her friends would get a sneak peek at the exhibit. Julia's mom was driving Julia there separately. The four girls planned to meet in the lobby. Nancy felt a shiver of excitement as she got out of the car. She had never entered a flower contest before. Entering this one would be extra-fun because she was doing it with her friends. As Mrs. Fayne and the girls walked into the Civic Center, Bess hugged the Pink Princess daisies to her chest. George turned to Bess and said, "Why did you bring them here, anyway? The flower show doesn't open for three more days." "I don't like to let them out of my sight," Bess said. "What if something happens to them?" George rolled her eyes. "Oh, brother." "Besides, I told Julia I'd bring them with me. That way she can take them home with her," Bess went on. "It's her turn to take care of them, until Friday." Just then Nancy spotted Julia standing in the corner of the lobby. Julia waved and rushed up to Nancy and her friends. "Hi!" she said, smiling. "Hi," Nancy said, smiling back. Julia reached out to take the daisies from Bess. "Here, I'll take them now." But Bess clung to the pot. "Uh, that's okay," she said. "I can carry them until we're all ready to go home." Julia looked a little surprised. "Okay, whatever," she said, shrugging. "This way, girls," Mrs. Fayne called out. She was heading through a set of double doors at the far end of the lobby. Nancy and her friends followed her. On the other side of the double doors was the exhibit hall, where the flower show would be taking place. The hall was a beehive of activity. Dozens of people were setting up exhibits. Nancy took a deep breath. It smelled like a florist shop -- times ten! Right near the double doors was an especially cool display. Nancy noticed it right away. It was a garden with the words River Heights spelled out with pink and yellow roses. Actually, it just said River Height. A young guy was still shaping the S with some pink roses. "Excuse me, girls," Mrs. Fayne said. "I see Mrs. Van Hall over there. She's the president of the garden club, and I need to speak to her. Why don't you take a look around?" "Okay, Mom," George said, nodding eagerly. The four girls started wandering around the exhibit hall. They saw all kinds of pretty displays. There were trees that had been trimmed to look like elephants, giraffes, and other animals. There were big, fancy gardens with stone statues and trickling fountains. "I've never seen a garden that was indoors," Bess remarked. Nancy glanced around. She had never seen so many flowers in one place! She didn't know the names of all of them, but she recognized some from her own yard. There were purple irises and yellow daffodils and pink peonies. There were tulips of all colors. There were also daisies. But nowhere in sight was there a Pink Princess daisy. "Look!" Julia said, pointing. "That sign! It says, Children's Exhibits." "Hey, that's our section!" Nancy said excitedly. "Let's check it out!" Nancy and her friends headed across the exhibit hall. There were a couple of long tables under the Children's Exhibits sign. On one table was a sign that said Category: Most Beautiful Flower. On the other table was a sign that said Category: Most Original Flower. "That's us," Bess said, skipping over to the first table. "Most Beautiful Flower. Our Pink Princess daisy is going to win first prize!" A girl was standing next to the Most Beautiful Flower table. She had long red hair and a freckled face, and she was wearing a yellow dress with polka dots all over it. The girl glared at the pot of Pink Princess daisies in Bess's hands. "My flower is going to win first prize," she said in a mean voice. "Not yours!" Copyright &copy; 2001 by Simon & Schuster Inc.